Values are starting to decline. The market is sliding. Price reductions are increasing. This is exactly what we start to hear around August as the market has transitioned from spring to summer. But is the market really crashing? It could be, but sometimes the issue is simple in that we’re not weighing the market in the right context. Today let’s look at a helpful scale analogy and then unpack the Sacramento market in depth (for those interested). Any thoughts? A Scale Analogy: Imagine being on a diet and stepping on a scale in the morning before breakfast and then again at night after eating all day. What would happen? Well, it’s going to look like you gained some weight during the day because the body is light and empty in the morning and naturally heavier at night after a day of eating. Unless you want to punish yourself with thoughts of weight gain, the key for using a scale would be to weigh yourself every day around the same time so you are comparing the same context each day. Otherwise when comparing one context (morning) with a different context (night), it might look like you gained weight when you might have actually lost some. The Big Point: In real estate we have to consider what it looks like to weigh the market. Often at this time of year we start hearing things like, “Values are starting to tank”, when in reality the market may simply be softening for the season. The problem is we don’t see the softening though because we’re stepping on the scale at the wrong time of day so to speak. For example, if we compare stats from June to July, it looks like the market is declining in value since stats have sagged. Yet if we step back and weigh the market in context by comparing June/July 2016 data vs June/July 2015 data, we see stats also sagged last year. Bingo! This helps us see it’s normal for the market to soften up at this time of year (of course it could be declining, but that’s a different post). In short, if we want to get better at seeing the market it’s critical to compare the latest month of data with the same month last year. Otherwise it’s very easy to start making market claims when the truth is we just might be misreading the trend. If you want to use bigger chunks of data like quarters, that’s fine too. Just compare the past quarter today with the same time period last year. You can also look at many years of data to get an even better sense of seasonal trends. DOWNLOAD 62 graphs HERE: Please download all graphs in this post (and more) here as a zip file. Use them for study, for your newsletter, or some on your blog. See my sharing policy for 5 ways to share (please don’t copy verbatim). Thanks. Slowing Market (Quick Summary): The hot spring season is definitely transitioning to a slower market. What do I mean? It’s taking slightly longer to sell today compared to last month, the median price and average sales price declined from the previous month, inventory saw a 20% increase from June (it’s still really low though), and price reductions have been more common. Yet at the same time the market is actually stronger this year as it was taking 4 days longer to sell last year and price metrics are a good 7-10% higher this year too. Overall the market feels fairly “hot” under $300,000, but there has been notable price resistance at higher price levels. These days well-priced properties are going quickly, but otherwise buyers can smell a high price from a mile away – and they’re not biting. It’s easy to think the market is starting to turn or tank, but it’s normal for the market to soften at this time of year. Unless we begin to see otherwise, right now it looks like we are seeing what seems like the start of a typical seasonal downtrend. Presidential Election & the Market: We’re hearing lots of talk about how the market is strong because it’s a presidential year, but let’s remember the market is doing what it is doing as a result of years of unfolding trends. The presidential election doesn’t all of a sudden trump (no pun intended) the factors that have been driving the market for years and have caused the market to be where it is today. For context, values in Sacramento were increasing rapidly in 2004, utterly tanking in despair in 2008, recovering in 2012 (due to cash investors and 4% rates), and now the market is figuring out how to be normal after modest value increases this spring. Sure, there could be some impact because it’s a presidential year, but let’s defuse the hype and not overstate it. Take a look at the stats and graphs below and see if you can discern any real difference because this year is a presidential year. 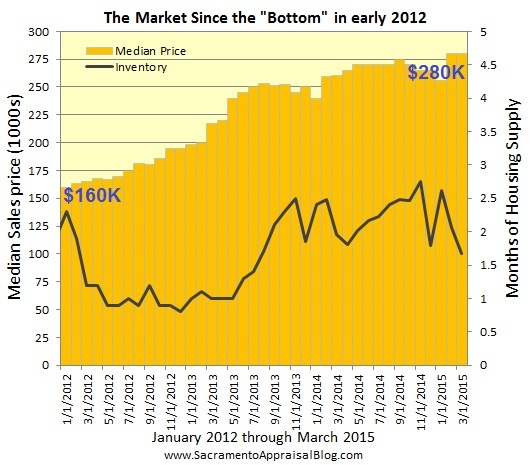 The median price is 100% higher than it was in early 2012. Sales volume has been about the same this year compared to last year. FHA volume is down about 8% this year compared to 2015. FHA sales were 26% of all sales last month. Cash sales were only 12% of all sales last month. It took an average of 27 days to sell a home last month, which is 2 days more than the previous month (and 4 less days compared to last year). REOs were only 2% of all sales last month and short sales were 2.7%. There is only 1.69 months of housing supply in Sacramento County, which is 11% lower than it was last year at the same time. The median price declined by 2.7% last month and the average sales price also declined, though both are 10% higher than they were last year at the same time. The median price is 97% higher than it was in early 2012. It took 1 day longer to sell last month compared to June (but 4 less days compared to July 2015). Sales volume is about the same as it was last year at the same time. Cash sales volume is 6% lower this year than last year. FHA sales volume is down nearly 8% this year so far. There is 1.96 months of housing supply in the region right now, which is just about the same as last year during this time. The median price, average sales price, and avg price per sq ft all declined last month from June, though they’re all up 7-8% from last year. Today’s median price is 72% higher than it was in early 2012. It took 3 more days to sell a house last month than the previous month (but 4 less days than last year at the same time). Sales volume was down about 11% in July 2016 compared to last July and is down slightly for the year about 3%. Both FHA sales and cash sales were each 15% of all sales last month. There is 2.25 months of housing supply in Placer County right now, which is up very slightly from last year at the same time (but up 30% from last month). The median price increased about 1% from the previous month, but for a better context it’s up 10% from last year at the same time. The average price per sq ft was $216 last month (was $202 last year at the same time). The average sales price was $480K last month (up about 11% from last year). Short sales were 0.07% of sales last month. Question: Did I miss anything? Any other market insight you’d like to add? I’d love to hear your take. What is the real estate market doing? That’s not always a quick 10-second answer you can give someone while standing in line at Starbucks. Yet here’s the scoop: Demand is very high, values are up, and inventory is down. We are seeing exactly what we would expect to see in a Spring market, and I’d like to invite you to unpack the market with me in this post so you can share specific trends with your clients. One Paragraph to Explain the Market: The market is having a normal Spring so far. Prices are up, sales volume is increasing, and housing inventory is down. Buyers are hungry out there, which is seen with pendings being 25% higher in the regional market in March 2015 compared to March 2014. Cash sales continue to decline in volume, while FHA buyers are gaining a greater share of the market. Short sales and bank-owned sales are still hovering at very low levels, though there was a slight uptick in volume this past quarter (nothing to sound the alarm about). It took an average of 51 days to sell a house in the region last month, which is 4 days longer than it took last year (thus while the market feels hot, we can also see the market is slowing down too). Well-priced listings are going quickly and experiencing multiple offers, but properties with adverse locations and/or a lack of upgrades are tending to sit on the market. There is a huge demand for quality inventory, yet at the same time the market is price sensitive since buyers are showing discretion. Many neighborhoods over these past few months experienced a seasonal increase in value (not all areas though). Remember in coming time that inventory historically sees a huge increase from April onward, and that can very easily change the tone of the market. NOTE: This post is longer since it is my big monthly market update. I am experimenting with more graphs and less text. Do you miss the numbers and bullet points? I’d love some feedback. DOWNLOAD 62 graphs HERE for free (zip file): Please download all 62 graphs here as a zip file (or send me an email). Use them for study, for your newsletter, or even some on your blog. See my sharing policy for 5 ways to share.